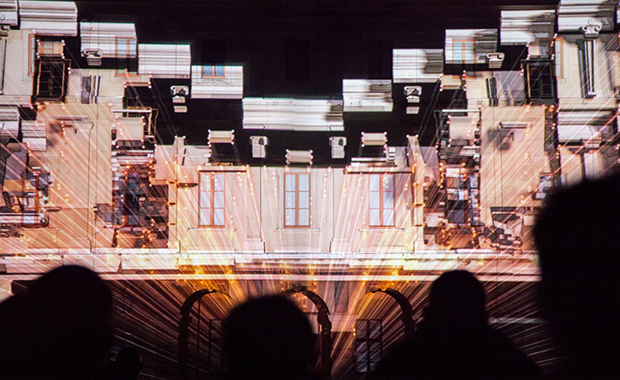 The international festival of audiovisual projections Genius Loci Weimar has recently launched the 3rd (2014) video mapping competition. It’s an unique media art festival which looks beyond the mere geometry of objects to explore the possibilities of reflecting the spirit of the place through projection art. For this competition, Genius Loci Weimar seeks for innovative ideas for the facade-projection festival held from 5th-17th August 2014. The organizers are seeking for innovative artistic video projection concepts for three historic facades: German National Theatre Weimar (DNT), Duchess Anna Amalia Library, The Ohm Kruger bust and Herder statue. Until the 15th of April 2014, artists from all over the world are invited to participate with a 30-second videoclip explaining the main concept. An independent jury, together with a public audience, will select the best artwork which will be exhibited in Weimar‘s city center. Three winning artists will be awarded a totaling prize money of 45,000 Euro to realise a 10-15 min long high-resolution audio-visual production, which can be presented in the form of video mapping on the respective facades on the evenings of 15th-17th August 2014. An innovative design in the form of an audio-visual video mapping, with particular observance paid to the Genius Loci. An individual, original and sophisticated handling of the spirit of the location with respect to the history and architecture, ect. The deliberate omission of erratic gimmickry and showmanship, intrusive clichés, and careless historical retelling. More information is available on the Official Website.